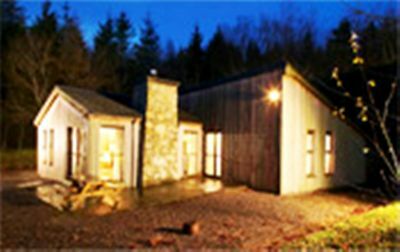 Ballyhoura Mountain Lodges in Ballyorgan, County Limerick are 9 four star, three bed, detached, timber lodges. On-site facilities include a picnic area with table and chairs and activity areas for children. The architect-designed homes are spacious, with a unique character that compliments their mature woodland setting and are a real home from home. Built by local craftsmen using local wood and red sandstone, the homes are furnished using the materials of businesses and artists in nearby villages: the suites and curtains in Ballyorgan, the beds in Ballylanders, the built-in furniture in Kilfinane and Ballylanders, the silk paintings in Kilavullen and the nature photographs in Glenroe. The Lodges have been in existance for over 12 years and underwent and extensive refurbishment programme in 2012 & 2013 formerly Ballyhoura Forest Homes now re branded Ballyhoura Mountain Lodges. The holiday homes all have three bedrooms, open plan living rooms and fully equipped kitchens. They also include satellite TV, DVD player and stove. Linen and towels are provided. A highchair and cot are available on request. The homes are situated in Ballyhoura country which is renowned for its authentic rural living experience, with its wealth of built and living heritage and world class facilities for recreation in the countryside, and situated at the base of the acclaimed Ballyhoura Mountain Bike Park. The location is also central for touring Cork, Limerick, Kerry, Clare, Tipperary and Waterford. Cutlery, Cooking utensils pots & pans, Bottle openers & wine openers provided! Electricity not charged for June, July and August but ir is charge per cottage for the other 9 months.